While no garden can be entirely safe from these ravaging forest creatures, deer resistant shrubs provide landscaping options that are unpalatable to deer. If deer are a problem in your area, choosing deer-resistant landscape plants goes a long way towards keeping your garden beautiful year-round, even after a friendly visit from a herd of white-tailed deer. Whether you live in the suburbs or a rural community, deer are the gardener's scourge. From late fall to early spring, almost as soon as their natural forage dies back, deer browse on ornamental trees, shrubs, and perennials. Because shrubs are at just the right height for deer to nosh on, they're often the hardest hit. Deer gain courage and boldly eat landscape plants, sometimes coming right up to the house and noshing on foundation plants. The colder and harsher the winter, the hungrier the deer, and the more your plants may suffer. Protecting the garden and landscape plants from deer provides the most protection. Deer fencing, often consisting of eight foot high wire mesh fence or shorter fences with an electric fence wire running across the top, can provide some amount of protection. Unfortunately, though, many suburban neighborhoods prohibit such fences. They're also unsightly. If erecting a fence is out of the question, choose deer-resistant plants. The solution for avid gardeners is to plant deer-resistant shrubs. Deer-resistant plants are any plants that deer don't like to eat. If you look around the typical North American forest, some native shrubs thrive. These shrubs have developed defense mechanisms over time that repels animals who wish to feed upon them. The leaves, stems, or other parts of the plant may be poisonous or simply taste bad to deer, or the plant may have thorns to protect itself. No plant is truly deer-proof, however. Deer may nibble on these shrubs just to see if they want to chow down on the entire plant. Most deer will give up after the first bite or two of a deer resistant shrub, leaving the main plant intact and ready to grow another season. Deer resistant shrubs may be divided into two categories: flowing and evergreen. There's enough variety in the list to provide gardeners in most gardening zones with many options. Intersperse deer resistant shrubs with other deer resistant plants, such as daffodils. You can also use one of the many foliage sprays that make leaves taste exceptionally bad to deer. Combining many tactics helps you win the battle against deer damage in the garden. Three old-time charmers make the list of shrubs unpalatable to deer: lilac, potentilla, and spiraea. Each flowers sometime between spring and late summer, producing abundant flowers. Some, such as potentilla, even provide glorious fall color interest. Lilac (Syringa) blooms in early to late spring with clusters of sweetly scented white, pink, mauve or purple flowers. Try not to prune too frequently, as the old woody stems produce new flowers for next year. While lilacs are often recommended for colder gardening zones, new cultivars can tolerate high humidity and warmer temperatures, formerly the bane of lilac fanciers. With over twenty species of single and double flowering varieties, you're sure to find one to complement your landscape. 'Potentilla', also called Buttercup Shrub, produces cheerful white, yellow or pink flowers in early to late summer. You can find potentilla suitable for gardening zones 2a through 6b. The deciduous shrub produces great autumn foliage colors too, with some varieties turning a rich, coppery red before shedding their leaves. 'Spiraea', also called Meadowsweet, produces abundant white or pink flowers. Native to North America, spiraea grows well in zones 4 through 9. They grow approximately four feet tall. Some shrubs, such as boxwood, juniper, and holly, provide beautiful shades of green foliage year-round. These deer resistant shrubs make excellent foundation plants, and some, such as holly, can tolerate shade. Boxwood (Buxus) creates a formal atmosphere in the garden. Shape boxwood into topiaries or let it grow into natural shapes. Dwarf and standard size boxwood are available, and provide great hedge material too. People either love or hate boxwood. Most dislike boxwood for its distinctive sharp smell, sometimes linked, unfortunately, to the odor of cat urine. Others don't mind the scent and enjoy the rich dark foliage and great variety of boxwood available. Boxwood can grow ten feet tall or more over a twenty-year period if left untrimmed, so be prepared to give your boxwood regular haircuts to keep it manageable. Holly (Ilex). 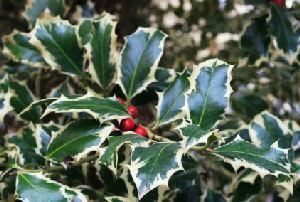 Ornamental holly is one of the prettiest plants around, with many variations available. For beautiful red berries, be sure to plant both a male and female plant within close proximity to each other, as the female plants need a pollinator. Because many varieties of holly have sharp and pointed leaves, some people plant rows of holly as a security hedge to deter trespassing. Juniper (Juniperus) are conifers, and retain their beautiful green foliage year-round. Upright and prostrate (low growing) varieties provide endless landscape possibilities. Beautiful foliage colors in shades of rich green and grayish-blue green blend harmoniously into the landscape. If planting or trimming juniper, be sure to wear gloves, as some people are highly allergic to juniper and develop an itchy skin rash after touching the leaves. For more information on deer-resistant planting, check with your local Cooperative Extension agent for free pamphlets or plant lists. He or she is likely to have a list of deer-resistant plants that will thrive in your gardening zone. You can also visit the following websites for more information. Rutgers University provides a searchable online database of deer-resistant plants, with search features by both botanical and common name. The Maryland Cooperative Extension includes a free fact sheet from their horticulture department, giving a great overview of deer, their feeding habits, and how to choose plants they won't like. Nature Hills Nursery provides a list, with photographs, of shrubs to choose.